FAQ: How Does Ultrasonic Vinyl Record Cleaning Work? How does ultrasonic vinyl record cleaning work, and what is the main difference to 'classic' cleaning methods? Ultrasonic cleaning is a very different approach compared to classic 'brush and wand' based cleaning methods. There is no mechanical interaction between a cleaning tool and the vinyl surface, which means no micro-scratches are introduced by the cleaning process. Brushes, pads and wands essentially remove dirt by scratching along the surface scraping away any dirt that is in their path. Piezo-electric ultrasonic transducers vibrate the bottom of the tank at 40 kHz. This introduces sound waves into the fluid in the tank. Like in sound waves in the air, this introduces high and low pressure regions that travel through the tank. In the low pressure regions small evacuated bubbles form. These bubbles move randomly in the tank until they collapse ("cavitate"). This cavitation occurs predominantly in the vicinity of a surface. This is shown in the Figure, which shows a series of high speed camera photos at 305000 frames/sec of a cavitating bubble in front of a surface. The photos show that an energetic water jet directed towards the surface is formed during the cavitation. This jet blasts away dirt particles attached to the surface. This is the main cleaning action of the ultrasonic process. The random movement of the bubbles before cavitation as well as the 'automatic self-alignment' of the water jets towards surfaces immersed in the cleaning fluid is the reason that the cleaning process works wherever the cleaning fluid can penetrate, even in difficult to reach nooks and crannies. This is impressively shown in the video, where it is demonstrated that an ultrasonic cleaner can remove dirt between two pressed together ceramic rings. This implies that there is not much concern about 'perfect spacing' of the records, or the orientation of the records relative to the transducers. It basically works wherever the fluid can penetrate. Cavitation of a vacuum bubble near a surface. A jet forms towards the surface as the bubble cavitates. This energetic jet is the main factor of the ultrasonic cleaning action. The figure shows a series of high-speed camera images taken at 305000 frames per second. From: E.A. Neppiras: "Accoustic Cavitation", Physics Reports 61(3), pp.159-251, 1980. ​ Piezo-electric ultrasonic transducers vibrate the bottom of the tank at 40 kHz. This introduces sound waves into the fluid in the tank. Like in sound waves in the air, this introduces high and low pressure regions that travel through the tank. In the low pressure regions small evacuated bubbles form. These bubbles move randomly in the tank until they collapse ("cavitate"). This cavitation occurs predominantly in the vicinity of a surface. 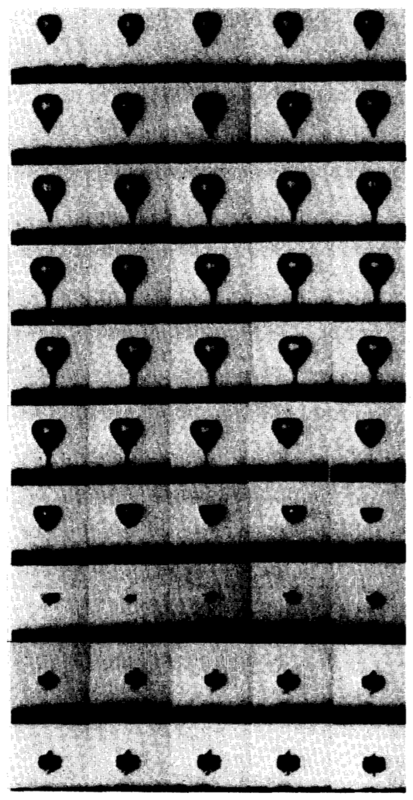 This is shown in the Figure, which shows a series of high speed camera photos at 305000 frames/sec of a cavitating bubble in front of a surface. ​ The random movement of the bubbles before cavitation as well as the 'automatic self-alignment' of the water jets towards surfaces immersed in the cleaning fluid is the reason that the cleaning process works wherever the cleaning fluid can penetrate, even in difficult to reach nooks and crannies. This is impressively shown in the video, where it is demonstrated that an ultrasonic cleaner can remove dirt between two pressed together ceramic rings. This implies that there is not much concern about 'perfect spacing' of the records, or the orientation of the records relative to the transducers. It basically works wherever the fluid can penetrate.